Thousands of people descended on Northwest beaches to clean up marine refuse. Thousands more fanned out across the region's inland waterways to uproot invasive species. The SOLV Beach and Riverside annual cleanup was held for the 26th time Saturday, and it was the nonprofit's biggest effort yet. More than 6,000 volunteers removed an estimated 142,231 pounds of trash and 57,685 pounds of invasive plants from watershed restoration projects -- nearly three times the amount of trash collected last year. "We expanded our focus this year from just litter to watershed restoration projects," said Rachael Pecore, SOLV program coordinator, adding that this weekend's cleanup for the first time included inland waterways. "Oregon and southwest Washington really stepped it up." Pecore said Saturday's 160 Northwest project sites were four times as many as last year. The organization said the expanded scope was a response to the Ocean Conservancy's recent estimates that up to 80 percent of marine litter starts on land. About 40 volunteers came out to a beach site on Swan Island in Portland. All were eager to do their part. "It's about getting to know your community," said Jordan LaBrec, 20, a sophomore at University of Portland who rallied more than a dozen students to assist at the site. "It helps people understand the problem of pollution and the problem of not caring. It might seem small, but it adds up." Vancouver middle school teacher Jerud Martin came to set an example. "It's a good community service, and I'll have stories to share with the kids," said Martin, 35. Carol Boucher, 54, of Portland, was the Swan Island site's team leader. She distributed gloves, tongs and bags to volunteers and recorded the amount and type of debris collected. "We don't want people to get hurt on the junk that is here," Boucher said. "I think we have a responsibility to fill in the gaps for the people who won't clean up for themselves." The beach, which sits along the Willamette River across from the Port of Portland's cargo terminals, was strewn with errant bottles, broken glass, old syringes and countless cigarette butts, and was one of about 50 project sites in northwest Oregon. "Some of this stuff you don't want to touch," said Kelly Podbielan, 43, of West Linn. "But you don't want to leave it there either." The SOLV cleanup coincided with the Bureau of Land Management's National Public Lands Day, which bolstered the event's volunteer ranks, Pecore said. 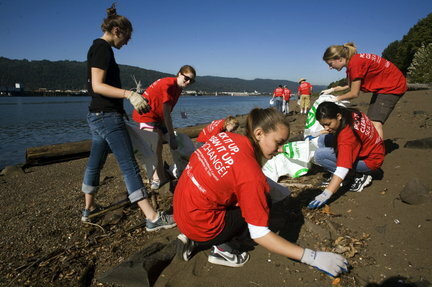 SOLV, a Hillsboro-based nonprofit which held the country's first beach cleanup in 1984, has partnered with the Ocean Conservancy to give the event global proportions since 1985. The Conservancy organizes an annual Coastal Cleanup that brings out more than half a million people in 100 countries who remove millions of pounds of trash from beaches and waterways. University of Portland freshman Elena Pettycrew said the fact that waterways are being restored in far-flung places makes her work at Swan Island feel like a global effort. She shared one of environmental activists' favorite sentiments. "Portland has always been my community and such a go-earth community," said Pettycrew, 18. "And I'd like to keep it green."